A solemn Thanksgiving Mass has been celebrated at the St. Joseph Minor Basilica, Elmina to mark the Diamond and Silver Jubilees of Rev. Srs. Mary Rita O’Mahony OLA and Monica Appiah OLA in Religious Life. The Anniversary Mass which was presided over by Most Rev. Matthias Kobena Nketsiah, was concelebrated by many priests and Monsignors with Religious Men and Women attending in their numbers. During the homily, the Archbishop, Most Rev. 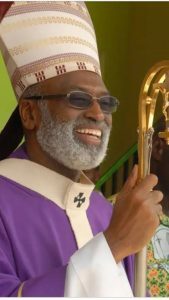 Matthias K. Nketsiah paid glowing tribute to the Religious Men and Women who had dedicated their lives to bring the Good News to the Archdiocese and beyond. The Archbishop was full of praise for Sr. Mary Rita who braved the arduous journey by boat just after her first profession from Ireland to work in Ghana as a Missionary since 1959 up to date. He urged Christians to imitate Christ whose disciples they are, in His desire to sacrifice His life to redeem human kind. He charged the Priests and Religious to represent Christ in their daily apostolate so that the people they minister to, will find hope and joy in their Christian living. He encouraged them to always remember their vows and keep them. One of the sisters who gave a brief history about the Society said that the Congregation of the Missionary Sisters f Our Lady of Apostles (OLA), was founded in Lyon (France) in 1876 by Fr. Augustine Planque, the Superior General of the SMA Fathers at the time. The formation of this Missionary Society was necessitated by the need to have a group that could help the evangelisation work of the SMA fathers in West Africa. According to the history, the OLA sisters arrived in the then Gold Coast in December 1883. Their first port of call was Elmina in the Archdiocese of Cape Coast. The sisters were the first Women Religious to have arrived and worked in the Gold Coast as primary evangelisers. They engaged in formation of Christian families, promotion of African women and children as well as education of the girl child. 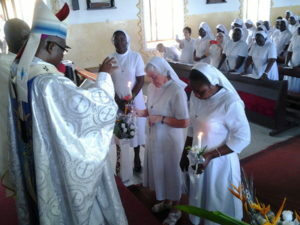 The OLA sisters established the first Catholic girl school at Elmina and later in many other places, using education as a tool of evangelisation. They also trained young Ghanaian girls to embrace the religious life and by 1933, three Ghanaians had been professed. Currently, the Congregation can boast of many indigenous sisters in all fields of endeavors with one of them, Rev. Sr. Felicia Harry, being the Superior General resident in Rome. Rev. Srs. Mary Rita O’Mahony and Monica Appiah are currently working at Brafuyaw and Elmina respectively.